Beniguet is either a pocket cruiser or a day boat. As a cruiser, she offers a cabin with two quarter-berths and a third one forward at child size. It is even possible to sleep three adults with a fore berth extension. As a day boat, she welcomes her crew is a two-meter long cockpit which offers an exceptional comfort and let you wandering along the coast. A lowered space on both sides of motor well allows stowing a bucket or your fishing equipment. The cabin gives the possibility to take a meal or a cup of tea inside, to find a shelter if raining or some shade on a sunny day. Madam will find a chemical or marine toilet. The steel centreboard rotates under the cockpit, and does not obstruct the cabin. It gives Beniguet much higher performances than most of the small cruisers inspired by tradition. As usual, I gave a lot of importance to the pleasure of steering a good sail-boat. Beniguet is clinker built in plywood-epoxy. 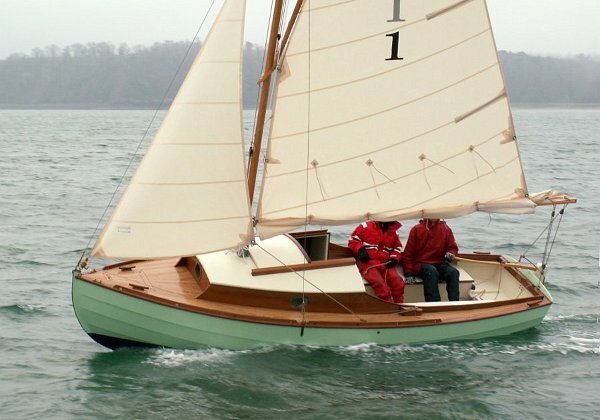 A very modern solution which is also in the spirit of a pure classic boat. By limiting the number of varnished pieces or by replacing them with oiled teak, maintenance will be equivalent to that of a polyester hull. The cockpit is water-tight and self-draining. The ballast is approximately 170 kg, half of which is placed within the centreboard, and therefore quite low in navigation. All this makes Beniguet a very dependable boat.